There’s an interesting article in the current issue of Fortean Times called “Westminster Weirdos”, all about the nuttier fringes of British politics. The main focus is on the parties contesting next month’s General Election, but there’s a brief mention of a very nutty fringe party that fielded a number of candidates way back in the General Election of 1992: the Natural Law Party. All the policies of the Natural Law Party centred around the practice of Transcendental Meditation (that’s a special kind of meditation devised by Maharishi Mahesh Yogi, best known as the Beatles’ guru in the 1960s). When they first appeared on the British political scene in 1992, I happened to be particularly interested in wacky New Age beliefs, reading lots of books on the subject and attending lectures at the Theosophical Society and Buddhist Society and places like that. 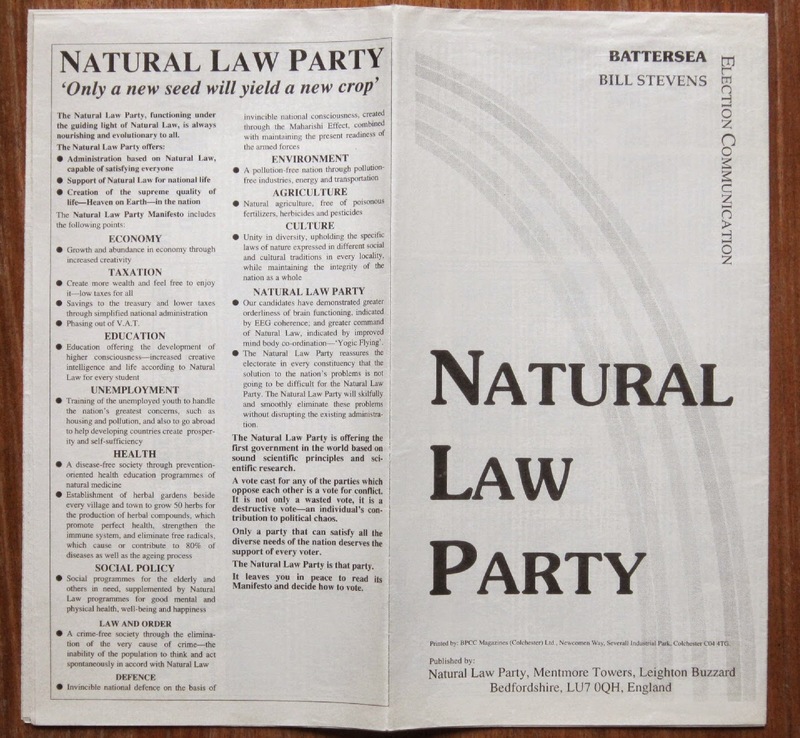 So I was fascinated by the Natural Law Party, and I’ve kept their campaign leaflet (pictured above) ever since. According to Wikipedia, William Stevens of the Natural Law Party got 92 votes in the 1992 General Election. I think one of those was mine, although at this distance in time I can’t be certain! “Time to Bring the Light of Science into Politics”. That sentiment appealed to me, since I was working as a scientist at the time. But for most people it would have had the opposite effect – an instant turn-off! Especially as the science in question was fundamental physics, which is one of the most abstract, mathematically complex disciplines of all. Just zoom in on the left-hand side of the page and look at all those symbols and equations! Admittedly they’ve been annotated with user-friendly words like “FREEDOM”, “SIMPLICITY” and “OMNIPOTENCE”, but they’re still pretty daunting for the non-mathematician. The thing that is depicted, as it says at the bottom, is “the Lagrangian of the superstring”. Now, how many people know what to do with a Lagrangian? I used to know, but I’ve forgotten – and I expect that most people who studied physics at degree level will say the same thing. To everyone else, it’s just so much mumbo-jumbo... which I guess is why only 92 Battersea residents voted for them! 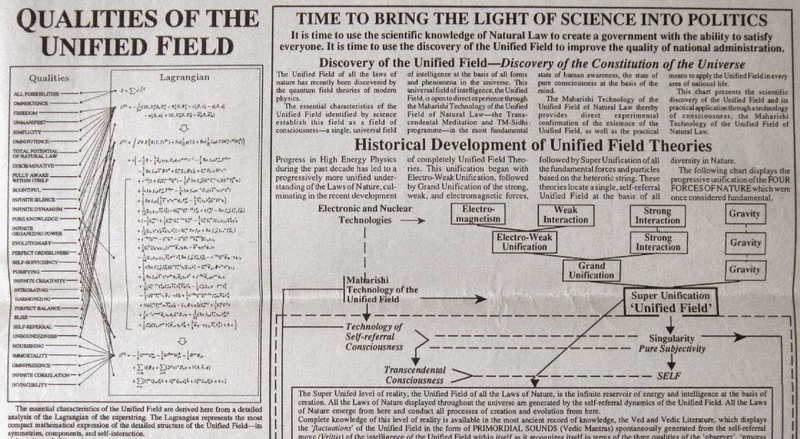 It’s not mumbo-jumbo, though – it’s real science (the equation, I mean – not the bits about omnipotence and freedom). The image below shows, on the left, a zoomed-in view of the bottom line from the Natural Law manifesto. 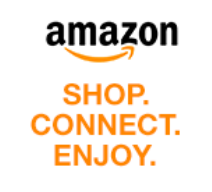 On the right is a closely similar equation from the book Why Does E = mc2? by Brian Cox and Jeff Forshaw. They describe it as “one of the most wonderful equations in physics”, and go on to say: “It really is possible to get a flavour of what is going on just by talking about the symbols without knowing any mathematics at all.” Sadly, however, they don’t say anything about “IMMORTALITY” or “INVINCIBILITY”. I agree with you up to a point, Colin. I actually enjoy hearing the different sides talking positively about their own policies, so I can make my own mind up whether I agree with them or not. What I hate is when people start destructively attacking the other side's personalities instead of their policies. This always happens, but in the old days when it was just the politicians themselves doing it you could ignore them like you say. But in these days of social media, more and more ordinary people do it too - during last year's European elections Twitter and Facebook were overflowing with ad hominem attacks stridently telling people who NOT to vote for. It's all so pointless, too... as if anyone would suddenly turn round and say "Gosh, thanks - I was just about to vote for that guy, but I've changed my mind now that you've yelled at me in UPPERCASE LETTERS." That never happens, does it, so why do people bother? I've never used Facebook or Twitter so I'm spared all that. There's a reason why so many Latin American governments are looking very seriously at having the DLF teach TM, and even Yogic Flying, in their school systems, and it has nothing to do with posters relating “the Lagrangian of the superstring” to consciousness.